All purpose vinyl gym mats with easy to remove covers, heavy duty vinyl covers and stitching, and quality shock absorbing foam. All gym mats are certified and have been tested to meet AS/NZS4422:1996 standards. Designed for elite, senior level, club and school level training. All fillings are made from quality density foam, designed to absorb the impact of even the hardest hits. Economically priced range offers great value for money. Designed and manufactured with high impact reduction. We now offer the latest in customisation for all types of hit shields. Designed with safety in mind. We now offer the latest in printing for all types of post padding. Ideal to promote your school, club or sponsor! 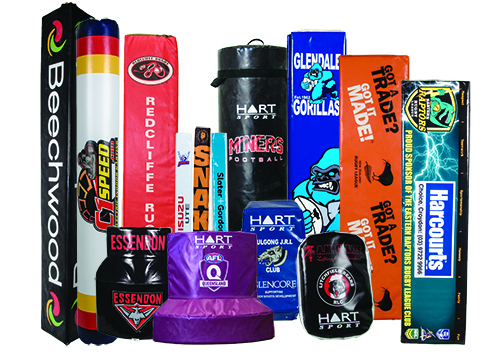 Combining safety and advertising, these triangular foam bolsters are made from a high density foam allowing maximum exposure by holding their shape.